BFO (Beat Frequency Oscillator) is a function of the ADF, I know that it has something to do with different types of NDB, but I do not know which type. And how and when do I use it? I heard that depends on the type of emission of the NDB in use. For what I know there are N0NA1A or N0NA2A but I do not understand how this imply the use of the BFO push button or even the differences (from operational point of view) between the two! Outside of the United States some stations are unmodulated and use an interrupted carrier for identification purposes. 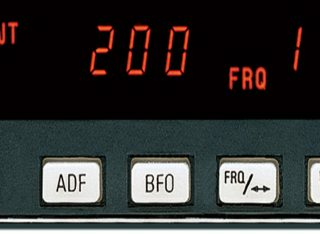 The BFO mode, activated and annunciated when the “BFO” button is depressed, permits the carrier wave and the associated Morse code identifier broadcast on the carrier wave to be heard. From an operational perspective, if you want to hear the Morse code if it is not audible, activate the BFO mode. Let me try to explain this from the radio perspective. Note: Horizontal axis is frequency, vertical axis is amplitude. Note: Vertical axis is time, with present being a the bottom, horizontal axis is frequency, increasing from left towards right and amplitude is encoded in color, with dark blue/black being low amplitude and white being high amplitude. The two sidebands are the wavy-looking structures to the left and right and they carry the audio information. The carrier is in the middle and can be seen as the bright white line, especially visible during moments of silence. 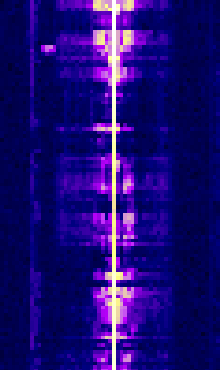 When we want to send let's say Morse Code telegraphy over AM, we get the A2A emission type: Carrier and two sidebands, each carrying Morse code data. Here, we can also see the bright white carrier and the Morse code in the sidebands, with lower being a bit weaker than the upper. Now, our AM receiver doesn't really know what's in the sidebands, the audio just goes to the speaker. So no special adjustments are needed to use a AM receiver for A2A emissions. OK, so what does this have to do with BFO? Well, BFO is needed when we want to receive carrier-less data using regular AM receiver. There isn't much to see, only the "carrier". However, if we take a look at a real-life recording of the spectrum, we'll see that the carrier is being turned on and off, with no sidebands. Now, when we input that to our AM receiver, we won't hear the Morse code. Depending on the receiver type, there might be an audible lack of noise when the carrier is on, but the expected tone is not there, since the sidebands are empty. So the answer would be to use the BFO with A1A NDBs and not to use it with the A2A NDBs. When two sinusoidal signals, with frequencies A and B are mixed together, the result is a pair of new signals with frequencies A+B and A-B. This phenomenon is called Beating. In case of radio, if the signals are close together, the difference can drop down into the audio spectrum. For example, beating of 353 kHz signal with 352 kHz signal will result (among other things), in a 1 kHz signal, which we can output to a speaker. The carrier and one sideband do not participate in the actual transmission of information and are therefore wasted power. Newer systems try to avoid using them, when possible, also saving space in the spectrum. However, the carrier simplifies receiver design. Depending on the region, the A2A beacons might have the carrier on all the time, as shown above, or might key the carrier as well as the sidebands. Furthermore, some might only have one sideband, and save some power through that. Regular AM receivers can receive signal with a carrier and only one sideband. This is called Compatible Sideband. The reinserted carrier frequency matches the original carrier. In this case, you won't hear any difference. The reinserted carrier has a slight offset from the original carrier. In this case, beating will occur. You should hear the Morse code identification properly, but you might also hear a low-frequency sound in the background, if the system is capable of reproducing it. The reinserted carrier has significant offset from the original carrier. In this case, you'll be able to hear both the original carrier and the Morse code identification. Note that the audio frequencies might be shifted in unusual ways, depending on where exactly the reinserted carrier was actually reinserted. To make the unmodulated parts of the A1A signal audible, ADF incorporates a BFO. This produces a signal slightly removed from the received frequency that is then mixed with it. The mixing of the two frequencies produces an audible beat frequency, the difference of the two. e.g. a BFO would generate a signal of 402 KHz to match a received signal of 400 KHz. The mixing or heterodyning of the two produces signals at 400 KHz, 402 KHz, 802 KHz and 2 KHz . The beat frequency of 2 KHz is the audible tone. Selecting the BFO on makes the N0N carrier wave audible and allows the A1A type of ident to be heard. BFO is not needed for an A2A signal which is already modulated to an audible frequency. How do you set up your nav instruments and coms during ground operations and takeoff? How to maintain your pitch when looking for other traffic in the pattern?